One day in early September, a whitehulled cruise ship is to sail up the Gulf of Finland, pass the Kronstadt Fortress, and tie up at a brand-new berth at Marine Facade — St. Petersburg’s answer to the Port of Miami. As the city of Peter the Great embraces the Love Boat generation, Russia is building its first modern cruise ship terminal. By 2010, there will be seven berths — enough to handle up to 1.5 million cruise and ferry passengers each season, more than four times the number that came to St. Petersburg by boat last summer. Marine Façade’s financial center, linked to St. Petersburg’s mainland by a suspension bridge and new north-south highway. “When Marine Façade is opened, it will be the largest dedicated cruise port of call in the world,” said Mark Ittel, a partner with Bermello Ajamil & Partners, a Miami-based architectural firm that designs cruise ports around the world. 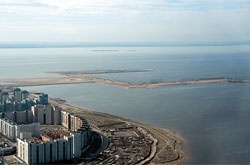 Europe’s new gateway to Russia is to offer bayside hotels with 2,000 rooms, a convention center, apartments for 35,000 people, shopping, entertainment and office complexes, two metro stations, and a high-speed highway to whisk visitors to St. Petersburg’s airports. Like many mega construction projects in contemporary Russia, the completion date has been set for that magic deadline year, 2020. “Two years ago, this was all water,” Elena Stont, deputy director of business relations for Terra Nova ZAO, the land reclamation company for the project, said last May while walking a flat, windswept expanse of brown sand that extended to the new concrete wharves. Later, her four-wheel drive utility vehicle jolted over a sand track, passing the steel shell of the future cruise ship terminal. Nearby, pipes pumped a sand slurry mix, steadily expanding the 150-acre landfill. 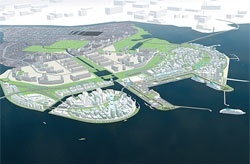 Plans call for creating a total of 1,000 acres by filling in shallow waters on the western edge of Vasilievsky Island, the main island in the Neva River Delta. Noting that this is three times larger than London’s Canary Wharf or Hamburg’s HafenCity, Russian planners say that Marine Façade is the biggest waterfront development project in Europe today. Confounding skeptics, the project is moving ahead. The Dutch company VanOord is on schedule to complete one third of the total landfill by the end of next year. In June, Russia’s PIK Group announced plans to spend over $3 billion to build more than 1 million square meters of housing on 140 acres of land PIK is acquiring on the southern section of Marine Façade. On a clear day, some apartment dwellers and hotel guests will be able to see Finland. “Residents will face the sea or the green ring,” Ms. Stont said, referring to a green belt that is to either cover or border the access highway. In May, Sberbank Northwest agreed to extend a $170 million credit line to finance a river port that will shuttle visitors from the cruise ship port to St. Petersburg’s historic core. A publicprivate partnership, Marine Façade expects to draw over $1.2 billion in private investment. Construction is underway on the Western High Speed Diameter, a $9 billion toll highway that is to connect the northern and southern ends of the KAD, St. Petersburg’s horseshoeshaped ring road. This October, the first 2-mile stretch is to open for traffic, and the 29-mile highway is tentatively scheduled for completion by 2014. In June, a $10 billion tender for building the rest of the highway was won by billionaire Oleg Deripaska’s Basic Element company in a consortium that includes Austria’s Strabag SE and France’s Bouygues SA. Built to carry 120,000 vehicles a day, the highway will run through Marine Façade in a half barrel trench designed to minimize noise and improve esthetics. Three exits will serve the new development, easing overall access to Vasilievsky Island. Only four miles at the most from downtown St. Petersburg, this fast-growing island suburb of 200,000 residents has long been seen scenic but inaccessible. The new highway will also allow road travel to the mainland around the clock. The two highway bridges over the Neva are to be built high enough for river traffic to pass below unimpeded. Visitors may enjoy the romance of the pre-dawn raising of the bridges over the Neva, but executives of international hotel chains have avoided Vasilievsky Island partly because of unease about the lack of 24-hour access to hospitals, airports, and food deliveries. “It will be 15 minutes from here to Pulkovo Airport,” Lev Pucshansky, vice president of the Marine Façade Management Company, said tracing his finger down a map of the planned waterfront complex. At present, the drive from the western end of the island takes from 40 minutes to 2 hours, depending on traffic. If St. Petersburg is Russia’s window on Europe, Marine Façade will be Europe’s gangplank into Russia. Around the globe, cities are upgrading their ports to draw more cruise tourism business. In August, Shanghai plans to open a $100 million cruise ship terminal near that city’s historic Bund district. In 2010, Singapore plans to follow suit with an expanded cruise terminal. Hong Kong is to open a new terminal in 2012. In St. Petersburg, long Russia’s main port, large cruise ships now dock in the cargo port. Some moor at the mouth of the Neva. Smaller cruise ships tie up at the English Embankment, a short walk from the Admiralty and the Hermitage, a practice that will continue with the new cruise ship port. In recent years, local officials debated building a cruise terminal at Kronstadt or at Lomonosov, the commercial port about 30 miles west of St. Petersburg. But cruise companies want their passengers to have direct, easy access to city centers. When completed in 2010, the new port will have seven berths — five for cruise ships and two for ferries. The maximum ship length will be almost 1,000 feet. The new port is expected to help revive ferry service from Finland, the Baltics, and Germany. With 4.7 million people, St. Petersburg is Europe’s fourth-largest city, but Russia’s cumbersome visa regulations have been faulted with preventing operators from creating regular ferry service from Helsinki and Tallinn. With ice-class vessels and a simplified visa regime, St. Petersburg could draw up to 1.5 million ferry passengers from northern Europe each year, Mr. Ittel estimated. The new port is designed to handle 12,000 passengers a day. Beyond the port, there is to be 4 million square meters of real estate development, roughly half for residences and half for offices, hotels, retail, and a convention center with a 5,000-seat concert hall. The shopping and entertainment areas are to be completed by 2012. Most of the office construction is to be on a newly created island in the northern section of the project. This is the final phase, scheduled for completion in 2020. With enough office space for 50,000 workers, this business island could directly compete with Okhta Center, the office tower complex that Gazpromneft plans to build closer to the historic center. But skeptics say there is not enough office demand in St. Petersburg for both projects to be successful. “I am not sure the city can support two financial centers,” Vladimir Frolov, editor of Project Baltia, a St. Petersburg-based bilingual architectural review magazine, said in an interview. The Union of Architects of St. Petersburg has recommended that Gazprom consider Marine Façade as an alternative to the Okhta site. They fear that construction of a quarter-mile high tower on the Okhta site will mar the 18th-century skyline of the city’s historic center. Marine Façade planners say they would welcome the Gazprom tower on their site. They may also be gambling that as Moscow grows ever larger, Russia’s federal government, currently dominated by St. Petersburg natives, may order the relocation of more federal agencies to St. Petersburg. In May the Constitutional Court completed its move from Moscow and started work in St. Petersburg. Now, the navy is to follow suit, returning to its historic home on the Neva.